Many municipalities add chlorine or chloramines to the water supply, which, in addition to having an unpleasant odor, can damage and dry your skin and hair. By filtering chlorine, chloramines, and other contaminants, you'll enjoy cleaner, spring-like water from every tap in your home. Now you can enjoy softer skin and hair, free of the drying effects of chemicals. Also, savor the difference in the kitchen, by cooking and brewing coffee and tea with tastier, filtered water. The system filters water at the point-of-entry to the home with zero wasted water, drainage, or chemical discharge. That means you're choosing sustainability for your home and the environment. No electricity is required to operate the system, which further reduces your ecological footprint. This 2-Stage Whole House Water Filter systems is easy to assemble and install, so you don't need to hassle with an expensive installation process or costly long-term maintenance. With better than bottled water quality from every tap in the home, you'll save lots of money, and you benefit from bathing and showering in it too. You may live in an area with old distribution pipes that contain Lead. Or perhaps your city adds Fluoride to the drinking water and you want it removed. By filtering chlorine, chloramines, and other contaminants, you'll enjoy cleaner, spring-like water from every tap in the house. Many municipalities add chlorine or chloramines to the water supply, which, in addition to having an unpleasant odor, can damage and dry your skin and hair. Now you can enjoy softer skin and hair, free of the drying effects of chemicals. Also, savor the difference in the kitchen, by cooking and brewing coffee and tea with tastier, filtered water. The system filters water at the point-of-entry to the home with zero wasted water, drainage, or chemical discharge. That means you're choosing sustainability for your home and the environment. This 2-Stage Whole House Water Filter systems is easy to assemble and install, so you don't need to hassle with an expensive installation process or costly long-term maintenance. With better than bottled water quality from every tap in the home, you'll save lots of money. **Based on manufacturer internal testing. Will handle up to 5ppm Fluoride/Lead. Is Your Household Safe From Lead? Unfortunately, the tragedy in Flint, Michigan, is just a symptom of a greater drinking-water epidemic in America. The Centers for Disease Control estimates that at least four million households are exposed to high levels of lead in their drinking-water. This means that millions of children are at risk for experiencing developmental delay, learning difficulties, and more harmful effects of lead intake. Approximately 60-70% of the US water supply includes added fluoride, a practice which began seventy years ago. The reasoning was that fluoride helps prevent tooth decay, so in theory, adding the chemical to the water supply would improve the general public's dental health. At present, it seems unlikely the nation will move to un-fluorinated water, and the argument rages on. If you're concerned about fluoride, however, you can take steps to remove it from your drinking water. With the Pelican Compact Fluoride System you can remove >80% of Fluoride from your water for the entire home. The main function of carbon filters is to remove the bad taste and smell from the drinking water. Carbon filters do not require a lot of maintenance, and with proper sediment filter changes and media changes, can provide the best tasting water. With improved taste, the filters also remove odor providing you with fresh tasting drinking water. They provide an excellent value for your money and definitely a better choice then bottled water. If you've ever cooked pasta in filtered water or made coffee or tea using filtered water you can definitely tell the difference. Chlorine is a chemical that is adsorbed into your foods and make your sauces and hot drinks taste foul. All of the top restaurants, chefs and even coffee houses use filtered water now so they can produce a quality product every time. Just like swimming in a chlorinated pool, showering in chlorinated water affects your skin and hair. Over time the chlorine will dry out your hair, requiring the use of conditioners for your hair and for those with chemically treated hair (colored) you may also bleach out your color. Your skin is an organ whose pores soak up chlorine when showering and vapors from steam. Because your skin does this, it can leave your skin itchy and uncomfortable. Money Back Guarantee Preassembled Housings! Pelican Water ("Pelican") warrants to the end user ("customer") that its tanks (13" and smaller), valves, in/out non-electric heads, bypass's, fittings and housings for POE systems ("Covered Items") will be free from defects in material and workmanship under normal use and service for the life of the system. No warranty is made with respect to defects or damaged due to neglect, misuse, alterations, accident, misapplication, physical damage, installation on water quality outside guidelines for system or damaged caused by fire, acts of God, or freezing. These warranties do not cover replacement filter cartridges, elements or lamps which are considered normal part of maintanence. Improper maintenance of system (ie not replacing filters or media) on time will be considered "neglect". For peak performance we recommend you change your filters no later than 6 months after installation. You may replace your filters sooner depending on overall usage. Never worry about when to change your filters again by signing up for our Water Shield Auto Ship program. Q. Why Does It Have A Clear Sediment Housing? For peak performance the clear prefilter housing allows you to see how plugged up your sediment filter so you can change it at the proper timeframe without the hassle of losing water pressure in the home. We recommend you change your filters no later than 6 months after installation even if it doesn't look very dirty as a lot of sediment is smaller than the eye can see. Never worry about when to change your filters again by signing up for our Water Shield Auto Ship program. Q. What is the difference between the PC200-F and PC300-LF? The PC300-LF uses an extra carbon block for the reduction of Lead on top of the chloramine and fluoride reduction you get with the PC200-F. Flow rate remains the same between both units at 5 GPM. No. The Pelican compact water filtration system requires no electricity to filter your water and does not waste any water. It simply uses the incoming water pressure from your water supply to filter your water through a unique filter design that doesn't require electricity. Q. How easy is it to install the Pelican EZ-Connect Series Premium Whole House Water System? Q. What is the cost to maintain the Pelican EZ-Connect Series? 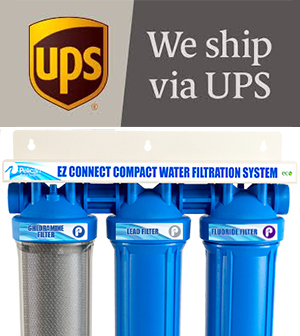 The cost to replace the filters for the Pelican EZ-Connect is as follows: PC200 sediment/Carbon filter is $99 and $99 for the fluoride filter every 6 months. The PC300-LG sediment filter is $99 for the carbon block, $199 for the lead filter and the fluoride block $99 every 6 months.